Welcome back to 3×3, where this week, I tell you why you should trade Josh Hamilton and Fernando Rodney, pick up Brandon Moss, and join hands in a prayer for Emilio Bonifacio. Heading into Sunday’s action, Josh Hamilton had the 22nd-worst contact rate (69.8%) and the third-highest swing rate (59.9%) in baseball. With his YOLO approach to every at bat, it’s not surprising that his 17.9% swinging strike rate and 30% strikeout rate rank among the worst in MLB. But really, none of this should be surprising. Hamilton has never had good, or even average plate discipline, he’s always relied on elite raw power and an uncanny ability to square the ball up when he does make contact. For his career, Hamilton has slugged .546 and popped up on only 3.3% of his batted balls, both of which rank among the best in baseball during that time. There’s nothing inherently wrong with Hamilton’s approach, except for the fact that it’s completely reliant on a single, finite quality: athleticism. Hitters like Hamilton tend not to age well, and although Hamilton is only 32 years old, the non-baseball stress he’s put his body through might speed up his aging curve a bit. Combine that with the fact that he’s playing his home games in a pitcher’s park for the first time in his career and it’s hard to imagine Hamilton coming anywhere close to his career-best production from last season. I don’t believe he’ll hit .300 ever again, nor would I bet on many more than 30 home runs this season. If one of your leaguemates believes that Hamilton’s pair of homers over the weekend signaled a turnaround, flip him for a Top 30 player. Though Fernando Rodney’s career results have been anything but consistent, his approach is as simple as it gets. Rodney starts hitters off with a hard, if not particularly overpowering, fastball, tilts his cap even further sideways, then finishes them off with a nasty changeup. That’s the amazing thing about Rodney’s results last season; after ten years, you’d think the league would’ve had a scouting report on him. So far this season, it seems like hitters may have finally figured him out. Rodney is attacking them with the same mix of pitches he’s used in the past, and it’s come with disastrous results, particularly on his signature offering, the changeup. Last season, hitters swung at about half of Rodney’s changeups, and whiffed about 25% of the time, according to Brooks Baseball. In two-strike counts, those rates jumped to nearly 70% and 30%, respectively. This season, Rodney’s changeup has induced a swing just 44% of the time and a miss only 14% of the time. 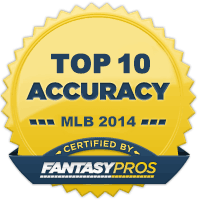 In two strike counts, his rates similarly fail to live up to last season, at 60% and 20%, respectively. Last season, Rodney allowed a preposterously low .080 slugging percentage on his changeup. So far this season, that number has jumped to .667. As with any relief pitcher, the sample size is problematic, but this is about the worst trend possible for Rodney. Without an overpowering heater or a reliable third pitch, his success is completely dependent on his changeup. If that pitch continues to fail him, he has no hope of recovering to deliver anything close to last season’s results. If you’ve got Rodney, offer him to a leaguemate who’s been burned by the upheaval in the Cubs, Tigers, or Brewers bullpens. Misery loves company, right? Bud Norris has been surprisingly effective this season, registering two wins in his first three starts. 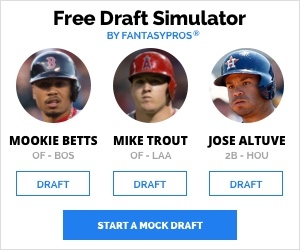 It’s great news for his fantasy owners, but anybody who’s watched the Houston Astros play this season knows that trend won’t continue. His 1.96 ERA would seem to indicate that Norris has turned a corner; if anything, he’s actually been a little bit worse than we’re used to. He’s been able to get his walks under control a bit, but it’s come at the expense of strikeouts, which have always been his primary source of fantasy value. I’d be very surprised if the strikeouts didn’t bounce back closer to his career norms, but if this new approach means Norris is pitching to more contact, this more well-rounded success will absolutely not continue. He has continued his tendency to allow more fly balls than grounders. While Minute Maid Park has never statistically lived up to its reputation as a great hitter’s park, its spacious and quirky outfield is one of the more difficult fielding assignments in baseball, which isn’t great news for Norris. Among Houston outfielders, only Justin Maxwell (more on him later) is an above average defender, and his impact is greatly mitigated any time that Chris Carter bungles his way into left field. Norris may yet have a productive season, but his results in ERA, W, and WHIP will almost certainly get significantly worse. If you can sell for a good price now, pull the trigger. My love for Mitchell Boggs a couple of weeks ago wasn’t exactly my most prescient moment. I’m sorry, dear readers. As a peace offering, I offer you Trevor Rosenthal. Rosenthal is unquestionably the last pitcher opponents would prefer to see emerge out of the St. Louis Cardinals’ bullpen. Flashing 97 mile-per-hour heat along with an effective curve and change, he’s whiffed more than a batter per inning and averaged ten strikeouts for every walk. Boggs’ historic implosion last week, along with Jason Motte‘s troubling MRI results have rattled the foundation of the St. Louis bullpen hierarchy. Boggs converted a save chance on Friday night, but allowed two baserunners in the process. Rosenthal tallied a couple of strikeouts on Sunday afternoon, but surrendered a home run (and the lead) to Ryan Braun. Cards’ manager Mike Matheny hasn’t wavered from the status quo quite yet, but I’d bet on Rosenthal’s skills to win out over the long term. 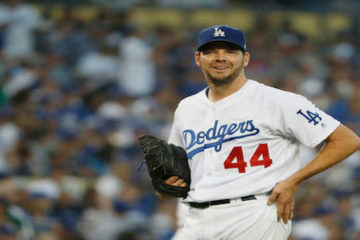 Even if he remains in his current role, he’s a valuable (and inexpensive) source of strikeouts, WHIP, and ERA. Brandon Moss was scintillating in a half season’s worth of action last year, socking 21 home runs in fewer than 300 plate appearances. Heading into this season, my only doubts surrounding Moss involved playing time, and now that he’s locked down the full time gig at first base, he’s a great option for any fantasy owner in need of power. Moss hasn’t just maintained his production from last season, he’s actually getting better. His plate discipline has improved significantly, he’s still hitting enough line drives to maintain the .350ish BABIP that drove his excellent batting average last season, and he’s continued to drive over 20% of his fly balls over the fence. His minor league track record has always been solid; I really don’t understand why he’s only owned in 45% of Yahoo! leagues. Moss won’t hurt you in batting average; he’ll be the easiest 30 home runs you’ll pick up all year. 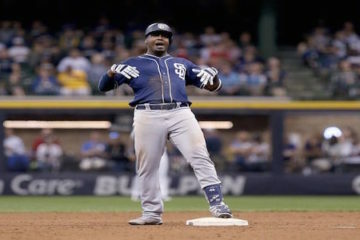 Now, if you don’t care about a hitter hurting your batting average, have I got a player for you! Justin Maxwell has lucked his way into a .326 batting average through the season’s first couple of weeks, but even when the hard truth of regression takes its toll, he’ll be a viable fantasy performer. As the most well-rounded Houston outfielder, Maxwell has a secure everyday gig, something he’s never had before. His hit tool leaves a bit to be desired, but Maxwell’s power and speed are legitimate. If he gets 600 plate appearances (he’s on pace for 633), Maxwell is money in the bank for 15/15, has a great shot at 20/20, and has an outside chance at 25/25. He won’t continue to contribute exactly what he’s giving you now, but he will be worthwhile asset in deeper leagues. 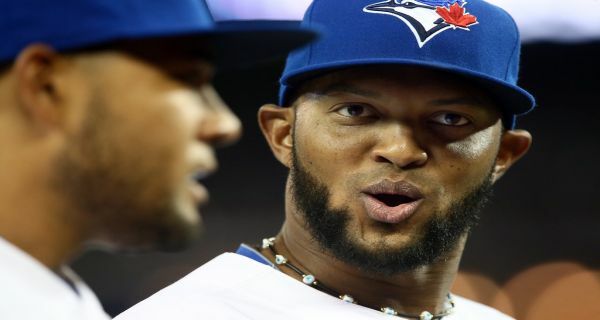 Emilio Bonifacio, Toronto Blue Jays 2B/OF/SS? A week after I wrote that I’d try not to repeat myself, here I am touting Emilio Bonifacio for the second time in three weeks. I swear, you guys, this is important. Bonifacio hasn’t been great this season, but given the injuries in the Toronto infield, the Jays have no choice but to give him an everyday job. Ok, he’s been terrible, but still, his competition for playing time is Munenori Kawasaki. Bonifacio isn’t going to hit .225 all year, and even if he hits .250, he’ll find his way to first base often enough to steal 40 bases. Couple that with the fact that Jose Reyes’ injury may help Bonifacio snag shortstop eligibility and his projection going forward is nothing but sunshine, rainbows, and unicorns. Through his first few years in the major leagues, Mike Minor’s production could never catch up to his pedigree. So far this season, he’s finally starting to pay off on all of the hype that accompanied his rise to the Altanta Braves rotation. Minor has been as good as any National League starter this season, allowing only one earned run while winning both of his first two starts. In one of my favorite statistical quirks of this season, his HR/9, BB/9 and ERA are all the same number: 0.69. While the ERA is eye-catching, his walk rate is the most notable of those stats. Minor has issued only one free pass against 11 strikeouts. He’s doing it by mixing his pitches more effectively than ever before. By Fangraphs linear weights, Minor’s best non-fastball pitches are his changeup and curve; his slider has been his least successful offering, by far. Through his first two starts, Minor has thrown significantly fewer sliders, slightly fewer fastballs, and many more changeups and curveballs. It seems overly simplistic, but Minor has improved by throwing his better pitches more often. His team will cool off, but there’s no reason to think Minor can’t accomplish a rise in the realm of what his teammate Kris Medlen pulled off last season. Closers live in a world of consistently small samples, which makes distinguishing a temporary slump from an ongoing trend exceptionally difficult. In Joel Hanrahan’s case, I’m leaning toward the former. I can’t say I was in favor of Boston’s move to bring Hanrahan in to take the closer’s gig, but in his limited time in Boston, his velocity has borne a much greater resemblance to his breakout 2011 season than his erratic 2012 campaign. The walks that plagued Hanrahan last season have continued, but the recent news that a sore hamstring has Hanrahan struggling to repeat his delivery can explain his erratic control (or lack thereof). The Red Sox have chosen to give Hanrahan a bit of a breather, promoting Andrew Bailey to ninth inning duties in the interim. Hanrahan has received a vote of confidence from manager John Farrell, and while a manager’s public support can often be fool’s gold, but I guess it’s better to have it than not. The bottom line is this: The Red Sox recognize that they’re rebuilding, and they didn’t trade for setup man, they traded for a closer. If you’ve got Hanrahan, it’d behoove you to grab Bailey as well, but rest assured, when Hanrahan comes back, he’ll pitch well enough to earn the job he’s been given. I don’t know what to think of Hamilton. He started off slow for a few games last year and I remember considering if I should trade him then he proceeded to be unbelievable. I don’t think the fact he is swinging and missing at a high rate means he has lost the athleticism it takes to hit .300. Sometimes in a slump you just cant hit anything. I am concerned though and would like to find a suitable trade to improve my infield because I have upton and mccutchen too. Good trade targets if I decide to sell? Kinda depends on what you need, but in the infield, it’s worth a shot to try and reach up for a guy like Wright or Pedroia or Tulo, but you can almost definitely get somebody like Paul Goldschmidt or Ben Zobrist (I’d deal Hamilton straight up to either of them). Hamilton is sort of a polarizing guy, so what you can get back for him could vary widely based on your trading partners’ perception. I’d go back and look at your draft/auction results and start off by targeting anybody who just missed him in the draft or was bidding on him in the auction. Those are the owners who’ll give you the best return. Good call. I’m gonna check the draft results.